We all know the power of words. They have incited revolutions, won and lost elections, galvanized movements, and begun and ended relationships. They have the power to cause incalculable harm and to bring restorative peace. Last week, Ken Burns’ wonderful PBS series, “The Roosevelts,” reminded me of the importance of word choice. Whereas Herbert Hoover called the banks closures he ordered a “moratorium,” Franklin Roosevelt called his closures a bank “holiday.” Further, he said hoarding money had become “unfashionable.” Wanting to be neither party poopers nor unfashionable, many people heeded his call to redeposit their money when the holiday was over. Although Americans had far more to fear than “fear itself,” Roosevelt’s choice of words helped halt the Depression’s slide and provided hope around which citizens could rally during the country’s long and painful economic recovery and second World War. It’s ironic that we are not taught words’ power as children. Rather we learn that “sticks and stones may break my bones, but words will never hurt me,” even as we know from first-hand experience that this bromide is not true. 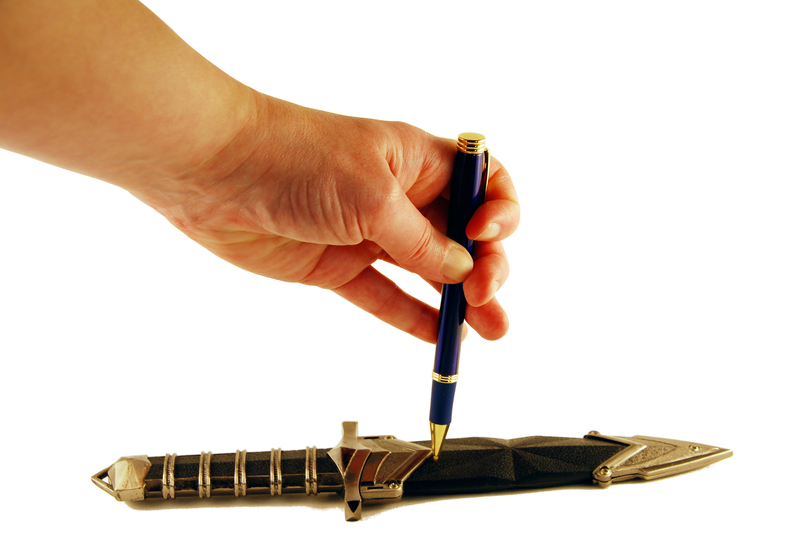 Edward Bulwer-Lytton wrote in his 1839 play Richelieu; or, The Conspiracy, “The pen is mightier than the sword.” It was a truism that had been written in various forms for centuries and probably repeated verbally since language began. As writers, we are taught to make each word count. Poets, in particular, are skillful at packing a punch within a tightly defined space. Good writers in all genres characterize, elicit emotions and convey images with a single word. We learn what a character is like when a smile is a grin or a smirk. Our skills as writers give us the power not only to entertain, but to educate, wound and heal. We can help people heal by encouraging them to find their own words. We can educate or inform through prose and poetry. We can provide escape or catharsis by immersing our readers in lives and places apart from their own. Most important is the effect we can have on the people with whom we come into contact each day. By taking the same care with our spoken words as we do with our written ones, we have the power to make our personal worlds a little better. This entry was posted in My posts and tagged Gina Carroll Howard, gina howard, Ken Burns, power of words, The Roosevelts, word choice, words, writer, writing. Bookmark the permalink. Excellent post! Years after they were spoken, I still remember words that cut like a knife. The words were spoken to me, and I’m sure words came out of my mouth that hurt or angered others. I regret some of those things I said. I also think of things I should have said to people, and wish I’d said them. Good and bad, healing and harming. I think we need to be especially careful of what we say to children. A compliment or a word of praise can mean so much, and they’ll remember our words. We should make it a point to be kind to strangers, offering a smile or a “Thank you,” if they open a door or perform another little act of kindness. Your post has given me food for thought, and I plan to be especially mindful of my spoken words. And I will continue to try to bring a smile to someone’s face with my fiction. There is power in the written word, and I want to write uplifting stories. Thanks, Joy. Yes, we often have no idea how often our words can deeply affect others.